Handsome, charismatic, quick-witted, and smug actor George Clooney has been at or near the top of the screen-star pantheon for over two decades. But not only is he known for magnetic screen presence and often-decent performances in the movies and television, but for his Left-liberal political activism. Think of "limousine liberals" or Hollywood Leftists, and Clooney often comes to mind first. And while he often supports causes that are unquestionably noble and humanitarian, he also throws his influence, money, and thousand-watt smile behind extremely questionable causes, such as the presidential candidacy of Democrat warmonger Hillary Clinton. It appears that soon Clooney will demonstrate both his roles as actor and as Left-activist in the upcoming film "Money Monster". Apollonian: Pallas sextile Mercury and Sun and parallel their ruler Venus. Dionysian: Pallas widely opposite Pluto and ruled by Jupiter which is quincunx Pluto and by Neptune which is square Jupiter. This is most likely a close balance between Apollonian and Dionysian factors. On "The Axis of Good and Evil" this puts Clooney into the "Statist" (authoritarian) category. It is very common for persons in this category to support unequivocally "good" or ethical ends but to favor unethical means (such as the use of force by the State) to achieve such ends. Collectivist: Venus quincunx Neptune; and Sun in the Second House opposite Neptune. No surprises here. Note that Clooney plays a thief in the popular and entertaining "Ocean's Eleven" movies. In real life, he joins the liberal crusade to redistribute wealth through government force while himself enjoying a vast fortune most of us can't imagine. Liberal: Moon and her ruler Saturn widely square Neptune and widely quincunx South Node. 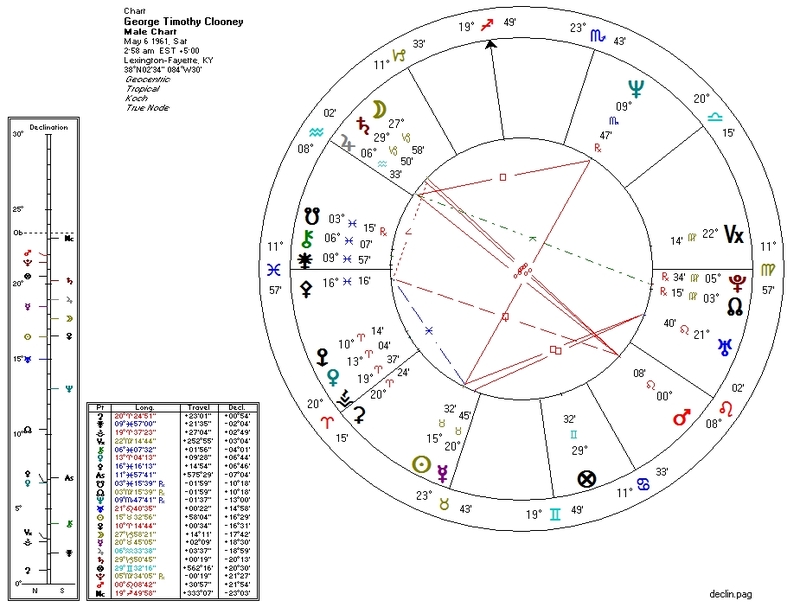 This is nothing we don't already know, but here we see the astrological underpinnings of Clooney's ideological leanings. Pallas parallel Venus, contraparallel Ascendant: Pallas/Venus, representing the potential for "weaponized charm", is ubiquitous in female celebrities. But men can also exploit the aspect. Sun opposite Neptune: common with hyper-celebrities who exude a constant glamour. Pallas Rising: "my ethics, in your face". Also tends to correspond to high physical dexterity. Mercury conjunct Sun: "I am my opinions". Mercury in Taurus contraparallel Jupiter in Aquarius: speech plus money plus social ideology. Mars in Leo in the Fifth House opposite Jupiter in Aquarius: a need to balance the actor versus the ideologue. Moon conjunct Saturn: married late in life. I don't know anything about Clooney's childhood, but the aspect suggests challenges then, probably involving one or both parents. I will probably skip "Money Monster" but would happily see him play a criminal or an action hero again.